In a small bowl mix yeast, 2 cups warm water and 2 tablespoons hoeny and set aside. In a large bowl, mix honey, warm water, eggs and oil. Add caraway seeds and salt. When yeast mixture foams, add it to mixture in large bowl. Stir in rye flour, oats, whole-wheat flour and white flour. Turn dough out on a well-floured board and knead for 15 to 20 minutes. Place dough in well-oiled bowl, turning to coat all surfaces with oil. Let rise 1 1/2 to 2 hours. Punch down dough and knead for 5 to 10 more minutes. 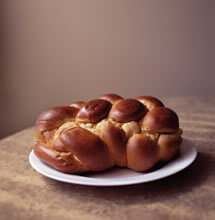 Separate Challah with a blessing and divide dough into seven pieces. Shape dough and place in greased pans. Let rise 1 to 1 1/2 hours. Brush loaves with beaten eggs and sprinkle with poppy or sesame seeds. Bake for 45 to 50 minutes or until you hear a hollow sound when tapped on the bottom. Remove from pans and cool on racks. USE: Baking sheets or loaf pans. Combine and let sit until yeast dissolves ~5 min. Stir with whisk & let sit another 5 minutes or so. Put in a stand mixer with a dough hook, set at 2 for 8 minutes. You can hand kneed, but it takes a while and may use more flour. Rye oatmeal challah I made it for the first time over Rosh Hashonah & Succos holidays. It was unbelievably scrumptious. I've had multi-grain breads before, but this was exra special, as well as appropriate for Shabbos and Yom Tov.